A few years ago, Craft Brew Alliance (the company that markets Kona, Widmer Brothers and Redhook) saw the rise of craft ciders and decided to get in on the action, creating Square Mile Cider Company. The cider house uses three apple varieties (Red Delicious, Yellow Delicious and Johnny Gold) and a lager yeast to produce two different brands: The Original is a classic hard cider and Spur and Vine is Northwest take on that classic cider with the addition of Galaxy hops. I knocked back both ciders side by side to figure out which style shines. The Original pours almost clear, with just a hint of yellow, and smells exactly how you’d think it would smell—like apples. Given the straightforward nose and appearance, I expected a rather straightforward (read: boring) taste. Something akin to a carbonated, boozy apple juice, which is what most ciders taste like in my opinion. They’re typically too sweet for my taste and lack any depth. Square Mile does a good job of not falling into that trap with the Original. It’s effervescent, crisp and dry, and has strong apple notes, but it isn’t saccharine. This isn’t boozy juice. It’s more like you sliced a bunch of fresh apples and dropped them in a bottle of Champagne. Square Mile recommends pouring the cider over ice. It sounds ridiculous, but I tried it because I’m a professional, and here’s what I think: Don’t do it. The Original is much better without the ice, which only dilutes the intriguing dry, effervescent qualities of the cider. Keep it neat. 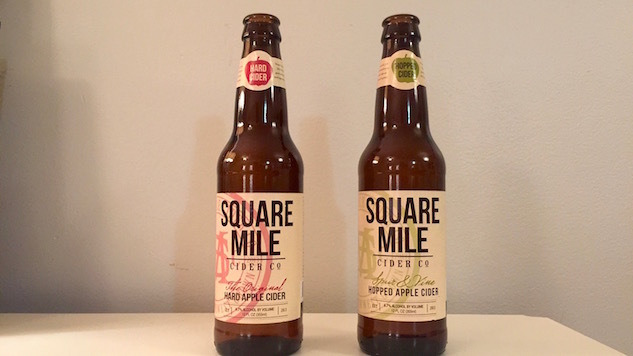 Square Mile uses the same base cider for Spur and Vine (same apples, same lager yeast) but adds Galaxy hops during cold fermentation in an attempt to impart the fruity flavors of the hops without the bitter notes. Spur and Vine pours a little darker than the Original, and has more going on in the nose. There are apples, sure, but also heavy hits of super ripe melon, and something earthy and green. And the nose doesn’t lie. This cider is more complex than the Original. It’s actually a bit sweeter, but in addition to the apple base, elements of peach and melon are layered throughout the sip. It’s as dry and effervescent, but not as crisp and has a more round mouthfeel. Square Mile is right about the hop addition during cold fermentation—you get the fruit, but none of the bitterness. But you also get something herbal, maybe even grassy. It’s enticing and keeps me going back for more. And while I typically don’t respond well to hopped up ciders, I can’t deny that Spur and Vine is the superior beverage here.